The technology is advancing rapidly, and nowadays we can even control our digital mixers with smartphones. If you’re asking “why is that even convenient”, the answer is quite easy. Sound producers were, up until recently, fixed to their chairs when they produced music, whereas live performers needed a person to operate the mixer manually. Today we’ll talk about the differences and similarities between some of the finest digital mixers ever made – Behringer’s XR18 and Soundcraft’s Ui16. Who are Soundcraft and Behringer? Behringer is a worldwide audio-equipment company who specialize in manufacturing premium-quality tech. They were founded by a Swiss engineer called Uli Behringer, hence the name, and they’re ranked as the 14th biggest music product manufacturer up to date. Soundcraft, on the other hand, is a British import company (formerly they used to manufacture) which specializes in mixing consoles. They’re a subsidiary company owned by Samsung Electronics. What these two brands have in common is that they’re both “responsible” for two exquisite mixing consoles suitable for androids and iPhones – Soundcraft for UI16 and Behringer for XR18. Basically, the UI16 is a moderately expensive 16-channel console suitable for smartphone digital mixer operation. It features an integrated Wi-Fi module and boasts cross-platform compatibility with Android, Windows, Linux, Mac OS, and iOS. You can pair up to ten smartphone or tablet devices on it and use them simultaneously, and you can rest assured that the quality of the output is impeccable due to Harman signal processing unit. Overall, there are plenty of channels, and it’s pretty to use it, so if you’re looking for a quality console, this one’s a safe option. The XR18 boasts a sturdy casing 18×18 channels, tri-mode wi-fi router, and Midas-designed mic preamps. It’s a bit more expensive than Soundcrafts UI-16, but it boasts a superb value for the money. This mixer features a bi-directional USB interface which allows direct recording to take place (using your smartphone). Apart from being huge and versatile, XR18 comes outfitted with exceptionally great firmware. Namely, Auto-mixing features are capable of managing microphone gain sharing, immediately balancing out the sound output. In the sections below we’re going to talk about different spheres of performance where Soundcraft’s Ui16 and Behringer’s XR18 are going to compete against each other. It’s important to note that both of these mixing units are of tremendous quality, it’s just that one is better for this, and the other for that. Let’s start off with the most important aspect of performance – the sound quality. 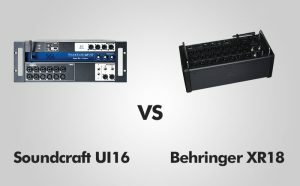 Generally, both Soundcraft’s UI16 and Behringer’s XR18 are known for their premium-quality sound output, but there are obvious differences that come into play once we compare them. In a nutshell, the UI16 sounds incredibly great due to Harman Signal processing unit – the sound quality of this digital mixer is way above average, but it simply can’t stand on the same ground as Behringer’s XR18, the latter being outfitted with superior Midas-designed pre-amps and auto-mixing features. While UI16 sounds great, the XR18 is capable of managing the shared gain between microphones (not to mention that it has impeccable firmware included), so it’s obvious that this round goes to the all-powerful XR18. This one’s interesting – both UI16 and XR18 have a built-in Wi-Fi connection, which is already pretty great, however, in terms of connection, it’s hard to say which one is better. Both of these digital mixing consoles can be operated remotely via smartphones, tablets, or PCs. The XR18 features Tri-Mode Wi-Fi router built into its construction, which completely eliminates the need for external routers. The bi-directional USB interface allows you to record directly on your iPad or smartphone, which is only to be expected from a quality mixer such as this. On the other hand, the UI16 allows you to pair up to ten devices and use them simultaneously. It’s also compatible with virtually all operating systems (iOS, Windows, Linux, MAC OS, and Android), so how do we determine which one is better? UI16 has sixteen channels available while XR18 has 18 x 18 channels – if you’re going to need a heavy-duty mixing console for numerous microphones, XR18 is your best bet. If you’re looking for reliable connections with superb compatibility, choose UI6. By now you already got the idea that UI16 and XR18 are both pricey digital mixing consoles, but they do not belong to the same price point category. Namely, Soundcraft’s Ui16 belongs to the medium bracket of the “moderately expensive” price point category, costing approximately $200 less than XR18. It’s great for people who are looking to upgrade their console but don’t feel too good about paying an arm and a leg for it. Behringer’s Xr18, being in the lower bracket of the “expensive” price point category sure is pricey, however, it boasts a huge value for the cash, and it’s one of the best mixers you could get for the buck. Xr18 has six dedicated aux jacks, the sound quality is unprecedented, it’s capable of recording multiple tracks simultaneously, and there’s a wide array of effects you could choose from. On the other hand, people don’t seem to like XR18’s GUI, and the iPad application isn’t exactly top-notch. The thing people like the least about XR18 is the price, as it’s quite expensive. You should choose UI16 if you’re looking for a quality mixer that doesn’t cost too much. The Graphical User Interface (GUI) is awesome, and it’s compatible with all modern operative systems. It, however, has fewer preamps than XR18, has no built-in supply of power, and it’s a bit bulkier than XR18. Overall, Behringer’s XR18 is just slightly more powerful and versatile than UI16. Even though both of these models boast superb quality, the winner of our contest is XR18 – Soundcraft’s UI16 is more than capable of following up though, it’s just that it’s better for people on a lower budget.